Did you know that we specialise and offer paint-less dent removal? 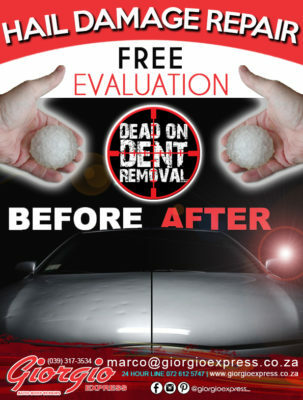 Which is perfect for vehicles that have hail dent damage. If your car was damaged in the hail storm we had on the South Coast yesterday, we invite you to bring your vehicle in for an obligation free repair assessment. Giorgio Express Auto Body Repairs is one of the most sophisticated panel shops in KwaZulu Natal. Our staff are highly qualified and experienced. Together with our state-of-the-art equipment, we are able to ensure that you and your vehicle are in good hands. We specialise in complex and intricate repairs, spray painting and polishing of the highest quality. If you find yourself part of a collision please contact us on our 24-hour line (072) 612-5747 and we will be there to help. Approved service centre for: Mercedes Benz, Smart, Chrysler, Jeep, Dodge, Alpha Romeo, Fiat, Lexus, Peugeot, Citroen, Volkswagen, Ford, Honda, Hyundai, Kia, Nissan, Toyota, GWM, Mazda, Mitsubishi, Opel, Chevrolet, Renault, Isuzu and TATA.